When the World Trade Organization (WTO) Director General Roberto Azevedo came calling in early February, he was flooded with representations from a host of farmers’ organisations with a list of pressing demands. They wanted a permanent solution to the issue of public stockholding of grains to ensure food security and also sought a focus on special safeguard mechanism (SSM) which protects developing countries from unexpected surges in imports of farm products. But poor farmers from India and the developing world found the dice loaded against them—as usual. Azevedo made it clear that these issues needed to be reformulated before they came up for discussion at the next ministerial meeting of the WTO in December in Buenos Aires. Even before the WTO boss landed in New Delhi, it was apparent that he would talk about the agenda he had come with—e-commerce, the Trade Facilitation Agreement and not the highly contentious issues on agriculture that have split the WTO. Just days earlier in Geneva, a news report had quoted India’s ambassador to the WTO Anjali Prasad as being highly critical of Azevedo’s assessment of the critical issues before WTO at a closed door meeting of trade envoys. According to Azevedo, who is also the chair of the trade negotiations committee, a permanent solution for public stockholding issue and SSM had been discussed in the run-up to the last ministerial meeting in Nairobi in 2015. He claimed there had been wide divergences. Instead, he spoke of the interest of developed countries such as Japan to ensure that developing countries did not place barriers on exports of farm products. Trade analysts here believe that the highlighting of e-commerce was taking centre stage because rich nations wanted to divert attention from the long-pending developmental issues of the Doha Round of negotiations. This conflict of interests although not new by any reckoning, is certain to result in yet another fractious meeting in Argentina this December with the G33 group of developing countries pitted against the rich club yet again. What has annoyed India is Azevedo’s purported statement to the closed door meeting of trade ambassadors that it would be difficult to find a definitive solution to the question unless the G33 proposal is revised altogether. As of now, under a “peace clause” India is permitted to continue its purchases of grains for public distribution without attracting penalties till a permanent solution is found. But India’s proposals for a permanent solution are not acceptable to developed countries. In a detailed letter to the WTO chief, major farmers’ representatives reminded Azevedo and OECD or the club of rich nations that Indian farmers receive nominal support through the administered price—a price that barely covered the cost of production. On the other hand, trade distorting subsidies came from developed nations, specially the US which “gives out 44 per cent of its value of production as applied domestic support”. As for SSM, there has been no movement although import surges could “wipe out the livelihoods of millions of farmers in India in one go”. 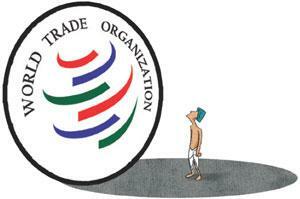 Given the repeated failure of WTO to address such concerns should agriculture be taken out of the trade body? That is what farmers are asking. Why has the WTO still not delivered on farm issues under its development mandate? When it has done nothing for farmers in developing and least developing countries why is WTO unleashing new issues like investment which will threaten access to land, water and undermine their existence further? There is also alarm over moves to discipline fisheries subsidies without applying the principle of special and differential treatment. The farmers’ appeal says they will not support any move to eliminate the subsidies that the fishing and farm sectors receive. But will New Delhi remain as resolute?